This is a companion piece to the guide to reducing illegal immigration. That page explains the "how": nuts and bolts things you can do. This page provides the background information, the "why". If you want to reduce illegal and massive immigration, it's important to understand how to do things correctly (the first link), but also to understand why I make those suggestions (this page). First, it's important to understand that the "establishment" (broadly defined) supports massive/illegal immigration. Illegal aliens don't just fall from the sky: they're allowed to come here because the establishment wants them to. If the establishment decided that they didn't want illegal aliens to come here, we'd have strict immigration enforcement in short order. Yes, some highly determined prospective illegal aliens would still be able to come here, but not many. And, if the establishment decided that they didn't want so many legal immigrants, we'd have fewer legal immigrants. The question then becomes, "how do we force the establishment to change their ways?" On one hand, that's very difficult because the establishment has most of the power: they control the media, political parties, large sums of money, and so on. On the other hand, it's not that difficult because the establishment needs intermediaries to spread the messages they want spread, to keep those outside the establishment in line, and to punish dissenters. Those intermediaries are a key part of supporting massive/illegal immigration, and they're also vulnerable and reachable. 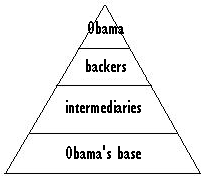 Obama's support network consists of him at the top of the pyramid. On the next level below are his financial backers, the owners of media companies, and so on. The next level below that would be the intermediaries: Obama's public-facing representatives such as reporters, pundits, major bloggers, and so on . And, the level below that would be his public base. Information mostly flows down, and two unconnected layers don't usually share information. For instance, George Soros rarely communicates directly with the Democratic Party base, he does it through those intermediaries. Obama rarely communicates (except at photo ops) with either the Democratic Party base or the intermediaries, he goes through, say, people like John Podesta. Information sometimes flows up: for instance, pundits might let the layer above them know through various means that one of Obama's plans that they've been told to sell to the public isn't sellable. Also, if one of the layers of that pyramid collapses, the whole pyramid will be in danger of collapse. Let's say that those in the second level (Soros et al) can't find intermediaries (reporters, pundits, etc.) to carry Soros' message to the Democratic Party base. How is the pyramid going to function? Is George Soros going to assume the role of a Kevin Drum or a Matt Yglesias? Not very likely. Thus, there are openings for Obama's opponents to have an impact on his support network. His opponents could try to create differences between the intermediaries and the base, could try to discredit various intermediaries and thus make it difficult for the upper layers to sell to the base, and could send a message to the upper layers of the support network by sending a message to various intermediaries. For an example, let's say Obama comes up with a plan that contains a major lie and that would have a negative impact on some in Obama's base. He communicates that plan to his backers, who in turn tell the intermediaries to sell the plan to the base. However, Obama's opponents then move to discredit some of those intermediaries over that plan and also point out to the negatively-affected portion of Obama's base that those intermediaries are selling a plan that will negatively impact them. Those intermediaries will then communicate upward the problems they're having. And, if enough of those intermediaries have enough problems, the upper layers might decide that Obama's plan needs to be modified. On the top level are those who stand to profit from massive/illegal immigration in one way or another: banks, businesses, top political leaders, financial backers like Soros and the Koch family, and so on. The middle layer consists of almost all of Obama's intermediaries together with intermediaries from the rightwing side of things. And, what really differentiates this support network from the other is that the base isn't that wide: few people who aren't part of the system consciously support massive/illegal immigration. Some might support it or not oppose it out of fear of being called names, but that doesn't mean that they actually support it. The massive/illegal immigration support pyramid is even more fragile than Obama's, because the base isn't as wide. And, opposing that network can best be done in the method outlined above: going after the intermediaries. If the intermediaries are completely unable to do their jobs, the pyramid will collapse. If the intermediaries are hobbled, the pyramid will crumble in parts and be mostly unable to function. For a tangible example, let's say that a business group and politicians decide to push an amnesty plan. They then communicate that plan to the intermediaries who are tasked with selling the plan to the general public. Examples of intermediaries would include Ezra Klein, Matt Yglesias, Greg Sargent, Frank Sharry, Tamar Jacoby, CNN reporters, Associated Press reporters, and so on. Their jobs are to write articles supporting the plan which will then be read and spread throughout the general public. But, let's say some of those intermediaries get strong pushback. Let's say that there's a concerted effort to discredit Ezra Klein over pushing a flawed plan. Is he going to keep selling a plan that's harming his reputation? Not too likely: few intermediaries are going to bet their entire careers on pushing a plan that's harming their careers. In that case, Ezra Klein would communicate to the layer above him that the plan isn't sellable, at least for him. If enough intermediaries felt enough heat over pushing flawed plans, there would be fewer flawed plans. As above, those at the upper layers aren't going to assume the public-facing intermediaries role: if Ezra Klein isn't willing to push a flawed plan, George Soros isn't going to step in and start writing opinion piece after opinion piece supporting it. 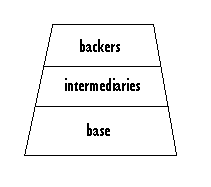 The top layer needs intermediaries to function. If those intermediaries aren't willing or able to sell the top layer's plans, the top layer is only going to be able to achieve their objectives through much less effective means. And, messages sent to the intermediaries are passed to the layer above. Thus, an effective way to oppose those on the top layer is to go after the intermediaries. That will have the effect of encouraging those on the top layer to promote better policies. My goal with that (and the dozens of similar tweets I've sent to others and the dozens of similar messages I've posted on Yglesias' blog) is to publicly shame him and discredit him with the goal of a) making him do what I want, and b) send a message to those in the layer above him. The only reason that's not successful is that so few others are willing to do it. If Yglesias (or the many others who are far worse than he is) were constantly publicly hounded over supporting massive and/or illegal immigration, their careers would take a hit. If those in the Democratic Party base who read and support Yglesias realized that he supports policies that would negatively impact them, his readership and influence would diminish . Like anyone else, Yglesias doesn't want his readership and influence to diminish, so he'd be forced into a corner: should he continue to support flawed policies and make his situation even worse, or should he leave promoting flawed policies to others? And, no doubt while deciding that he'll communicate what's happening to those on the layer above him. Now, assume that Ezra Klein, Greg Sargent, Adam Serwer, Kevin Drum, The Nation, The New Republic, CNN and Associated Press reporters and so on are all in the same situation. Assume they're all pushing flawed policies and all are being discredited over those policies. Are they going to put their careers on the line to push flawed policies, or are they going to stop pushing those policies and demand that they be changed? Aside from a small number of pure ideologues and those personally involved in immigration such as for ethnic reasons, almost all intermediaries are going to put their careers first. And, that will leave those in the top layer out of luck: as above, George Soros isn't going to start penning a series of pro-amnesty editorials. For literally thousands of examples of me putting the above into practice, see most of the posts here (start on the topics page) and see my Twitter feed: @24AheadDotCom_ . The latter covers many more topics than are covered here and is much more informal, but large numbers of my tweets have the goal of discrediting and shaming intermediaries to reduce massive/illegal immigration. Some others do that as well, either on Twitter or in the comments sections on blogs and the like. However, most who oppose massive/illegal immigration in such venues do things that aren't that effective such as just participating in an echo chamber or concentrating on the illegal aliens themselves rather than the intermediaries. Instead of doing that, please spend the same time helping me discredit and shame the intermediaries. And, for specific things you can do, see the guide. Within the intermediaries level there are sublevels. For instance, a Washington Post pundit is above a frequent blogger at DailyKos. And, the dynamic between major levels similar to what happens at sublevels, i.e., the WaPo pundit will basically tell DailyKos bloggers what to say. However, all of them are intermediaries: passing messages from the top level to the base. It's highly doubtful whether there's a "Moriarty" or even just a small group of people pulling everyone else's strings on illegal/massive immigration. It's also not at all productive to find out whether there is one or not or to engage in speculation about it. You'd never know for sure and speculating about it just plays into the hands of the intermediaries: they'll use your speculation to portray you as a conspiracy nut. It's also not necessary as described in the rest of the post. I sent over a dozen tweets about Van Jones' "Contract for the American Dream". Some were to him and his organization, others were to intermediaries that promoted the plan, but there were also two or three tweets that I sent to non-intermediaries who had retweeted Jones' plan. The goal of the latter was to separate Jones from his base. Likewise, I've sent several tweets like "there's little fundamental diff btw #MoJo & #Koch Bros. on #immigration" (referring to Mother Jones and the Koch family) to non-intermediaries who'd retweeted MoJo's articles supporting massive/illegal immigration with the same goal of separating them from their base.